The Stormwater Management rules, N.J.A.C. 7:8 specify stormwater management standards that are mandatory for new major development. The New Jersey Stormwater Best Management Practices Manual (BMP manual) is developed to provide guidance to address the standards in the Stormwater Management Rules, N.J.A.C. 7:8. The BMP manual provides examples of ways to meet the standards contained in the rule. The methods referenced in the BMP manual are one way of achieving the standards. An applicant is welcome to demonstrate that other proposed management practices will also achieve the standards established in the rules. The BMP Manual is a developed by the New Jersey Department of Environmental Protection, in coordination with the New Jersey Department of Agriculture, the New Jersey Department of Community Affairs, the New Jersey Department of Transportation, municipal engineers, county engineers, consulting firms, contractors, and environmental organizations. The BMP manual has been drafted to assist review agencies and the regulated community. The methods in the BMP manual can be utilized without need for additional documentation to address the performance standards in the rule. The Department anticipates providing guidance on additional best management practices and new information on already included practices as research and development occurs in this field. 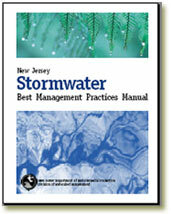 Future updates of the BMP Manual will be available through www.njstormwater.org. BMP MANUAL - April 2004 Revised September 2014, February 2016, September 2016, November 2016, September 2017 & November 2018. Cover and Contents: Includes the cover pages, Notes on Technical Updates, Acknowledgements, and Table of Contents. Chapter One: Impacts of Development on Runoff discusses the impact of development on the quality and quantity of stormwater runoff. Chapter Three:Regional and Municipal Stormwater Management Plans presents guidance on the development of regional and municipal stormwater management plans. Chapter Four: Stormwater Pollutant Removal Criteria provides guidance on how to meet the water quality performance standards. Chapter Five:Computing Stormwater Runoff Rates and Volumes presents the mathematical methods for the stormwater runoff rates, volumes, and the stormwater quality and quantity design storms. This chapter provides information computations for unconnected impervious areas, and also contains an overview of various stormwater pollutant loading models. Chapter Six: Groundwater Recharge discusses the groundwater recharge methodology, the groundwater recharge design storm, and the details of the New Jersey Groundwater Recharge Spreadsheet (NJGRS). Chapter Seven: Landscaping provides information on vegetation and landscaping for stormwater management measures. Chapter Eight: Maintenance and Retrofit of Stormwater Management Measures provides information to be included and considered in a maintenance plan, and discusses retrofit of stormwater management facilities. Appendix A: Low Impact Development Checklist provides information to assist reviewers and designers in the demonstration that nonstructural stormwater management measures have been implemented in a project. Download Appendix A in Word Format. Appendix B: Municipal Regulations Checklist provides information to assist municipalities in incorporating nonstructural stormwater management measures into the master plan, land use and zoning ordinances. Appendix C: Sample Municipal Stormwater Management Plan provides an example as well as guidance on the municipal plan required to be developed by every municipality. Download Appendix C in Word Format. Appendix D: Model Municipal Stormwater Control Ordinance for Municipalities provides a sample stormwater ordinance consistent with the requirements of the Stormwater Management Rules. Download Appendix D in Word Format.